Millions of individuals suffer from back pain on a daily basis and lives are often put on hold because small tasks become too difficult to perform. Back pain can be an incapacitating condition leading to stress and an overwhelming search for answers, which often leads to a black hole because many are afraid and intimidated to learn more about the spine. For this reason, Dr. Donald Corenman has continued to author many lectures, articles and research studies relating to back pain. He recently published, Everything You Wanted To Know About The Back: A Consumers Guide To The Diagnosis And Treatment Of Lower Back Pain. All potential lower back treatments are highlighted including the appropriate medications and surgical options to consider, as well as indications for injections such as selective nerve root blocks, epidurals, facet blocks and discograms. Lumbar spine trauma is discussed in both recognition and treatment. The biomechanics of rehabilitation are evaluated based upon each specific disorder and patient outcomes are considered during the discussion. This book targets patients who are suffering from chronic back pain and challenges them to learn more about their specific disorder. It opens up about the mechanics of the spine and provides information in an easy to read, understandable format. This book is perfect for the individual who is suffering from chronic back pain, yet doesn’t understand where it is coming from and is contemplating various treatment options. Everything You Wanted To Know About The Back: A Consumers Guide To The Diagnosis And Treatment Of Lower Back Pain was written to give patients a broader knowledge about every question they have ever had about back pain and unveils the layers of answers that lie within the discs and ligaments of the spine. 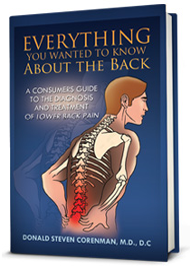 Everything You Wanted To Know About The Back: A Consumers Guide To The Diagnosis And Treatment Of Lower Back has become a concrete guide through the back pain root causes, the factors that exacerbate the problem, and the appropriate course of treatment, for years to come. Available now from AuthorHouse Order Today!